Two things happened when Carlos Santana was signed to a three year deal. The line up got better. The outfield defense got worse. Oh. Uh. Hey there, Rhys. Look, you’re not really an outfielder. We both knew that. That’s fine, though – when you’re one of the best hitters in baseball, your bat offsets the value you lose with the glove. 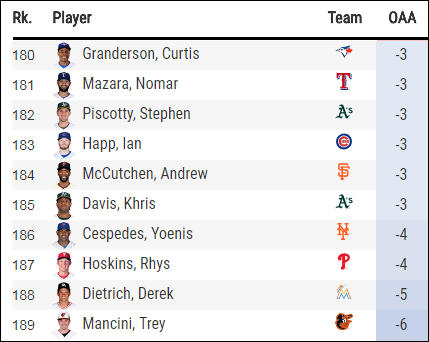 With one of the best fielders in baseball and one of the worst, the Phillies outfield defense rates out at…average. Exactly average. 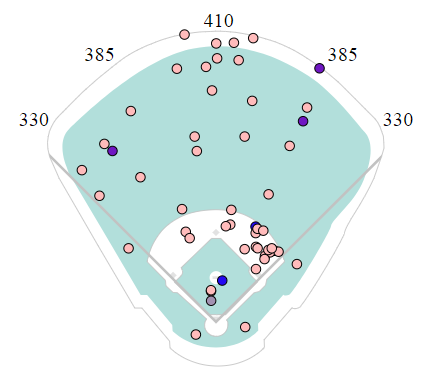 The Phillies were expected to catch 87% of the fly balls, and they caught 87% of them. Overlay a plot of the plays that Herrera and Hoskins have made, and it’s clear that the defensive limitations of our mashing left fielder are offset by Herrera’s excellent range. There was some hand-wringing when Santana was signed regarding how Hoskins would fare in the outfield. The short answer seems to be “Not well”. The long answer? “Not well, but it doesn’t really matter thanks to Herrera”. Standout Hitter: Jorge Alfaro. Alfaro had himself a week, hitting 2 homers en route to a 1.076 OPS. Though this level of success might be fleeting (.545 BABIP), he made some real strides offensively – his contact rate is up, his swinging strike rate is down, and he reduced his strikeout rate by almost 10 percentage points (!!!!). He’s still swinging too much and striking out too frequently, but hey – just a week ago he looked absolutely lost at the plate. Baby steps. Standout Pitcher: Aaron Nola. Lemme hit you with some numbers. What’s that spell? ACE. Nola is 19th in baseball by WARP, 9th by fWAR, and 2nd in rWAR. Any way you slice it up, he’s among the best pitchers in the game right now. Enjoy it – what he’s doing is special. Sit-Down Hitter: Carlos Santana. Coming into the season, Santana’s offensive output projected to be the opposite of rough – not rough. (Were you expecting me to say something else?) To this point, however, the BABIP gods have spat upon him – Santana’s .163 BABIP is by far the worst in baseball. Santana is still taking his walks, but those can only carry him so far. His xBA is 100 points higher than his current BA, so this isn’t a case of making poor contact – the ball is just finding the fielders instead of open space. As a switch hitter, he’s taking the majority of his PA as a lefty (97 PA vs. 35 PA as a righty). 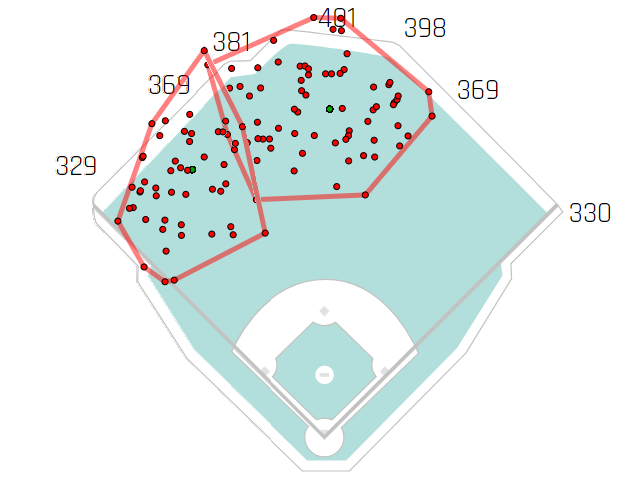 Here’s a spray chart of his outs as a lefty, courtesy of Statcast. Sure, he’s pulling his grounders, but he’s spraying the ball everywhere to the outfield. It hasn’t been pretty so far, but there isn’t much of a reason to believe his ineptitude will continue for the entire season. Sit-Down Pitcher: Ben Lively. There have been 898 games so far in 2018. 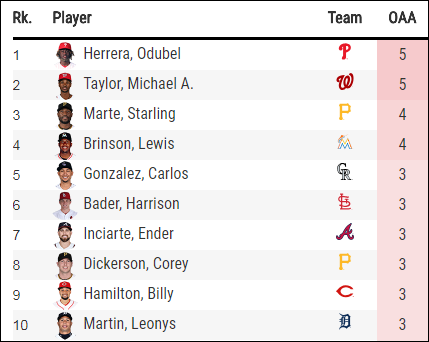 Ben Lively’s 2.1 inning, 7 ER start on April 26th ranks as the 13th worst. Bill James, father of Sabermetrics, came up with the concept of “Game Score” in order to quantify how a particular start went. 50 is average. Lively’s start clocked in at 12. After his disastrous outing, Lively was placed on the 10-Day DL with a lower back strain. At least there’s an explanation as to why it went so poorly. Trevor Bauer is polarizing, to say the least. Recently, he took to Twitter to claim the Astros pitchers are using a foreign substance on baseballs in order to increase their spin rate (which in turn will make their pitches harder to hit). He put his money where his mouth is – in his start on Monday, his spin rate was significantly up in the 1st inning before dropping down to his normal level for the rest of the game. What a masterful troll. I don’t know how I’ve lived my entire Twitter life not following MLB GIFS, but I know I won’t live the rest of my life without it. Pablo Sandoval, a.k.a. “Kung Fu Panda”, was forced to pitch in the 9th inning of a blowout against the Dodgers. He hasn’t carried a good bat for almost half a decade. Based on his early results, perhaps he should give it a go from the mound. Mariners legend Ichiro Suzuki has retired. Here’s a rundown of some of the things he accomplished over the course of a HOF career. Baseball will miss him. For Xbox One owners – right now, Super Mega Baseball 2 is free and I’m not exaggerating when I say it’s the most fun I’ve had with a baseball game ever. Make sure you snag it. < Previous Week 4: Are the Phillies ACTUALLY Good?